Chris and Rifa sift through the detritus of the past week to pick out their favourite bits of the arts, culture, tech and diversity. Freshly ground in Brighton on the English south coast. Chris and Rifa take their weekly dip into the choppy waters of culture, tech and diversity. This week we catch up with two iconic queer TV shows: the second season of makeover reality hit Queer Eye on Netflix and groundbreaking FX drama series Pose, about the underground trans ball scene in 1980s New York, which is on the BBC iPlayer. This expanded into a broader conversation about LGBTQI and QTIPOC representation, privilege and ally-ship. Chris is reading David Grann's non fiction book White Darkness, about Henry Worsley's solo attempt to cross Antarctica, while Rifa's reading Oprah's new pithy advice quotations book The Path Made Clear. Find us on Facebook and Instagram. If you're enjoying Refigure, please help us grow our audience by leaving a nice review, 'following' us and sharing with your friends. Thanks a lot! We're in Greece right now, so next week's Refigure should have a distinctly mediterranean feel. 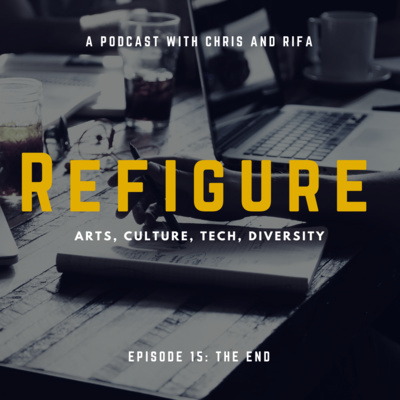 Rifa and Chris do their weekly dance of near-death with the all powerful octopus of culture, art, tech and diversity. This week we reflect on Jim Bob's solo show at Shepherds Bush Empire (where Chris was part of the band). We then binge-watch the second series of Brit Marling's brilliant reality-bending mystery TV series The OA, which has gone up on Netflix. Finally we taste-test three different artisan vegan cheeses from Fauxmagerie, the deli in Brixton Market, while arguing if vegan cheese (or even normal dairy cheese) is a Good Thing. As usual, please give us a 'like' and a 'follow' and leave a nice review, it makes a massive difference to how widely we're heard if you support us. Thanks a lot. Find us on Insta @refigureuk and on Facebook at RefigurePod. We made a BONUS episode of Refigure, in which we unpick our reactions to Ricky Gervais' new TV series After Life made for Netflix, which has had a pile of attention and wild praise. Too convoluted and lengthy a conversation to include in the main episode. Enjoy! As always, please subscribe and 'like' and leave a nice rating and review. We're on Facebook and Instagram. Back next week with a normal Refigure. Yo! Welcome to Chris and Rifa's weekly ramble through the arts, culture, tech and diversity. This week we went to the pictures to watch Captain Marvel and we also did our first Tate Modern trip of the year, to check out Dorothea Tanning, Franz West and Pierre Bonnard, though he scarcely got a look in. We recorded the Tate segment in the members' café, so it's a lot noisier and harder to hear than usual. Chris also recommends Njideka Akunyili Crosby's beautiful large mural Remain, Thriving above the entrance to Brixton Tube. Chris is reading Evan Ratliff's excellent new crime non-fic The Mastermind, while Rifa is loving Jim Bob From Carter: In The Shadow Of My Former Self. Find us on Facebook at Refigurepod and on Insta @refigureuk. Chris and Rifa's week in the arts, culture, diversity and tech. Episode #15 – last in the current series. We argue about the latest TV version of a John Le Carré novel, Park Chan-Wook's adaptation of The Little Drummer Girl, starring Florence Pugh, Michael Shannon and Alexander Skarsgard. We also binged on Netflix comedy Great News and compared it to the crop of similar shows like 30 Rock and The Good Place. In What You Reading For? Chris has just finished lost children's classic 'The Tree That Sat Down' by Beverley Nichols. Meanwhile Rifa is ploughing through Michelle Obama's much hyped memoir 'Becoming'. Thank you very much for listening to season one of Refigure. We'll drop a few one-off specials over the Christmas season and then be back in spring 2019 with season two. Please subscribe, 'like' us, give us a nice rating or review and visit the Facebook page http://facebook.com/refigurepod and the Insta feed http://instagram.com/refigureuk. Lots of love. Byeee! Rifa and Christopher's weekly misadventures in the arts, culture, tech and diversity. Episode #14 – our penultimate episode of Season One. This week we went to the cinema to check out Steve McQueen's intense new heist thriller Widows, starring Viola Davis. We also took another trip up to Tate Modern to look at Christian Marclay's wonderful 2010 piece Clock, built from cut up clips from throughout cinema history. Rifa watched John Leguizamo's acclaimed one-man Broadway show Latin History For Moron's, which is now up on Netflix. In What You Reading For? Rifa highlights Ayoola Solarin's Dazed Digital article 'Frida Kahlo Is Not Your Symbol' about the commercial commodification of a communist art icon. http://www.dazeddigital.com/art-photography/article/40259/1/frida-kahlo-is-not-your-symbol Chris also read a magazine article this week; April Ryan's essay in the Washington Post, 'I'm A Black Woman, Trump loves insulting people like me.' https://www.washingtonpost.com/outlook/2018/11/10/im-black-woman-white-house-reporter-trump-loves-insulting-people-like-me/?utm_term=.80a0d6c4dcd2 Thank you for listening. Please 'like', subscribe, leave a nice rating and review – and best of all tell your friends about us. We'd love to hear your favourite arts of 2018 for our end of year review – visit the Facebook page to contribute. http://facebook.com/refigurepod and you can also follow us on Instagram @refigureuk. Cheerio. 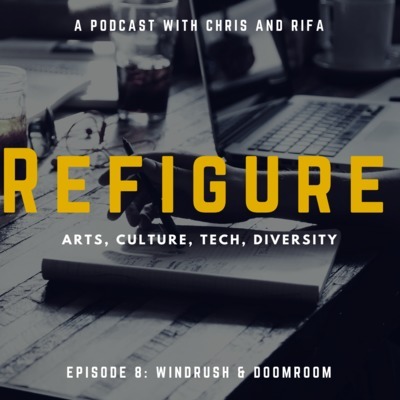 Christopher and Rifa slowly open a creaky door onto the arts, culture, tech and diversity. Episode #13. Unlucky for some. Rifa manages to get a ticket for Bristol's hottest righteous rock band Idles at the Concorde 2. Meanwhile, still avoiding live bands, Chris checks out Truestory Theatre's imaginative production of Dracula at The Spire. We also binge the new Netflix reboot of Sabrina The Teenage Witch, now called The Chilling Adventures Of Sabrina. In What You Reading For? Rifa gets annoyed with Gavin Strange's Do Lectures self-help book 'Do Fly' and much prefers Nikki Gattenby's book 'SuperEngaged'. Chris is re-reading for the second time in two years Lewis Hyde's classic 'Trickster Makes This World', trying to think about it in the context of the rise of the trolling alt-right. Thank you for listening. If you're enjoying Refigure please 'like', subscribe, leave a nice comment and rating and share us with your friends. You can visit our Facebook page – http://facebook.com/refigurepod and our Insta feed – http://instagram.com/refigureUK. Rifa and Chris scrabble through the detritus of the week's arts, culture, tech and diversity. Episode #12 is meant to be a Netflix special but our fearsome pair stupidly ate a load of intense Thai takeout during taping, so the second half goes a bit loopy in a chilli-high haze. Anyway, they watch the new Derren Brown special Sacrifice, in which Derren tries to solve racism by attempting to 'persuade' a (friendly) bigot to take a bullet for an illegal immigrant. They also binge psychedelic multi-reality drama series Maniac, starring Emma Stone and Jonah Hill. Chris is reading Robin Ince's new non-fiction book about psychology, I'm A Joke And So Are You. Rifa is still reading Arundhati Roy's The Ministry Of Utmost Happiness and feels differently about it now. Thank you for listening, as usual if you're enjoying Refigure, please 'like' and subscribe and share with friends and leave us a nice review. We're on Facebook at http://facebook.com/refigurepod and Insta @refigureUK. Cheerio. Rifa and Chris waffle on about their week in the arts, culture, tech and inclusivity. Episode #11 is a bit more highfalutin than usual. Rifa gets invited to the Woman Of The Year Awards and brings home a bulging goodie bag, while Chris stays in with new Netflix' new Paul Greengrass film 22 July. Then they also go to Convivial Tools one-day symposium, inspired by Ivan Illich, which takes place at the Design Museum. In What You Reading For? Chris has gone back to Ivan Illich's classic 1970s books, in particular Tools For Conviviality. Rifa is reading The Kindness Method by Shahroo Izadi. Thank you so much for listening. As usual, if you're enjoying Refigure please hit those 'like' and 'subscribe' buttons and share us with your friends. Also, let us know what you think about any of the topics we talk about by hitting up the Facebook page: http://facebook.com/refigurepod and follow us on Insta @refigureuk. Thank you. Chris and Rifa dig into their week in culture. This week we taped the show on an iPhone internal microphone, in a hotel room in central Edinburgh, so forgive us if the sound is a bit off. We went to the V&A in London to check out the Video Games exhibition but got distracted by the even better Future Starts Now exhibition about how technology is reshaping all our lives. We also checked out Danish company Makropol's intense, immersive (mixed reality) theatre production Doom Room at The Old Market in Hove. Rifa is reading articles about how the UK Government is mistreating the Windrush Generation and Chris is digging into the new Haruki Murakami short story collection Men Without Women. We're in Scotland because we're on our way up to Dundee to check out the new Victoria & Albert Design Museum that just opened. So next week's episode will feature this gorgeous new V&A and our short Scottish mini-adventure. Welcome to Refigure, in which Chris and Rifa talk about their week in culture with their mouths full of Japanese food. In episode #7 our team binges BBC America thriller series Killing Eve, as well as getting unnecessarily upset about the first episode of Hugo Blick's overwrought drama Black Earth Rising. Rifa chats about her latest She Says Brighton event and Chris recommends Saatchi in-house composer Alex Ball's YouTube channel. Rifa has also just dived into Arundhati Roy's second novel, The Ministry Of Utmost Happiness. Rifa and Christopher unpack a week of culture, tech, reading and general nonsense. In episode 06 Chris spends the week on a storytelling and virtual reality training course, while Rifa catches up with Netflix doc series Wild Wild Country and shows her cousin around Brighton. Rifa is thinking about an opinion piece in the Tate magazine, while Chris recommends a longread in The Daily Beast about the man who stole millions from McDonald's Monopoly. Follow us @refigureuk and join the conversation on the FB page http://facebook.com/RefigurePod. "When you buried us you didn't realise we were seeds." Chris and Rifa binged HBO miniseries Sharp Objects, starring Amy Adams and talk about inclusion and diversity advocate David McQueen. Rifa is reading Maya Angelou and Chris is reading David Grann's 'Killers Of The Flower Moon'. Episode #4 – "It's not Adventure Time!" This week Rifa and Chris watch Reading Festival livestreams on the BBC iPlayer and compare two high-production podcast series, Slow Burn (Slate Plus) and Folk On Foot (Matthew Bannister). In 'What You Reading For' (yeah our book bit has a proper name now – and its own jingle) Rifa got through Dave Eggers' Monk Of Mokha (Hamish Hamilton/Penguin) in one day and she's bingeing Matt Groening's Disenchantment on Netflix, while Chris is ploughing through Zeynep Tufekci's book Twitter & Teargas (Yale University Press) and got emotional watching Michaela Coel's MacTaggart Lecture. If you're enjoying Refigure please give us a 'like', subscribe, write a nice rating and especially tell your friends about the show. And let us know what you think about this week's topics over on Facebook (facebook.com/refigurepod). Cheers. "James Brown's in it!" Rifa and Christopher recap their week in culture, including a day out to Tate Modern, the legacy of Aretha Franklin and whether The Blues Brothers film is any good. Chris recommends N.K. Jemisin's Broken Earth trilogy and (sticking like glue to the art theme) Rifa is reading the exhibition book of last year's Soul Of A Nation show, which was also at the Tate. 'Namaste' just means 'hello', yeah? 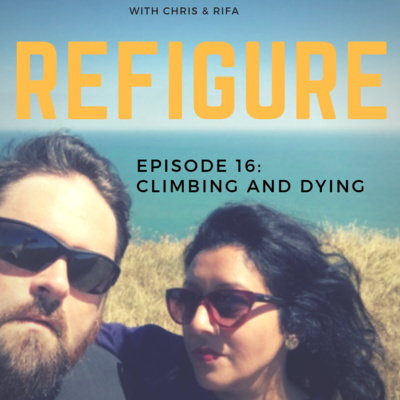 This week Chris and Rifa talk about the demise of local radio, decolonising beauty and the annoying language of yoga. "So who would Frida Kahlo choose as a pepper pot, if she was a salt shaker?" 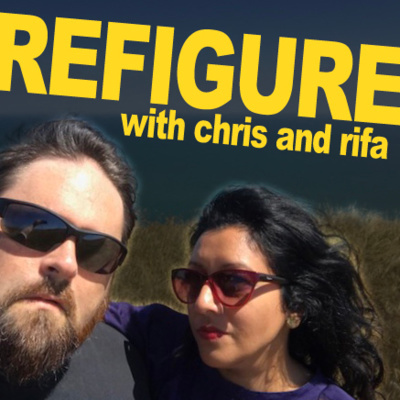 Welcome to Refigure episode #01, in which Chris and Rifa sit in their brand new bed and recap their week in culture and silliness.